What Happens When A Lawyer Does Not Back Up? I’m Jerry, a long time IT consultant and managed service provider located in West Monroe, Louisiana. Among my clients I have several law offices that I manage the computers and network for. I often advise the lawyers on today’s current IT processes and also take the office’s tech support phone calls for help with life’s daily computer problems. So on this Friday morning I went over to Bear’s office. I talked a bit to his secretary, Ellie Mae, about the office and it’s IT needs. Then Bear came in. I got to work on the server. Data migrated. Lots of talk about what should be on the server and what should not. I asked him for his backup drive for the server. Nada. Not one. He said his data was on the workstations too, and he had hard copies. Besides Ellie Mae backs up what folders she has permissions to about once a week. He said he didn’t need to spend any more money. It’s a new server! After half an hour of me preaching about having a good backup system Bear ordered a USB drive from Amazon. After a few days it arrived and I installed. Windows Server Backup. Back up everything. Cost was about $100 or so for the drive. Fast forward to last week. Ellie Mae called. 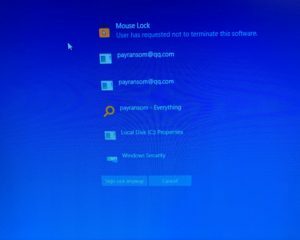 She said there was a mouse program on the server that is stopping here from logging in and all the data for the S drive was gone. I tasked her with a few questions then asked her to let me speak with Bear. I advised that I better come out. It was not pretty. Encrypted. Everything. All data. Locked down tight. Apparently one of the workstations had a trojan warning that kept coming up for the past day or so. Guess where that lead to! After a few quick searches and Bear asking me “who” I decided that I would pull the backup drive and test the data. YES! All there. I pulled the server hard drives and put them on Bear’s desk so he could pursue the “who” if he wanted. I dropped some new drives in, created a raid volume and did a clean install of Microsoft Windows Server 2016. I like to do fresh installs when I think there is cause for worry on what may or may not have also been backed up. I just restored the needed data. Configuring the server went pretty quickly. After seeing how the office operates I changed up a few things to accommodate. All done. Moral of the story. Crap hits the fan on Friday. If you want to be in court on Monday (or even know you aren’t supposed to be) then BACKUP! Windows Server backup is built in to Windows Server. A desktop USB for a small server is $100 – $200. NAS devices even are cheap these days. Not being able to conduct business is very expensive. If you need assistance with backups at your business, give me a call. 318-599-9621. I can look things over and give you some thoughts on your current process or design a new one for you. Its a good thing Ellie Mae knew the right man to call!! Great Job! !